Are You Playing the Telephone Game as an Electronics Manufacturer? Maybe you remember the Telephone Game from childhood –one person whispers a story or phrase to the next person and tells them to pass it on. They turn and whisper as much of it as possible (as much as they remember!) to the next person, and so on down the line. When the last person has heard the message, they repeat it out loud. Everyone gets a good laugh when the original message is then stated, and all the players realize how distorted it got as it was passed down the line. It’s great fun as a party game; not so great if it’s your training methodology. See if this scenario sounds familiar. A new piece of equipment is purchased, and two or three of your key operators get the original hands-on training from the factory during installation. 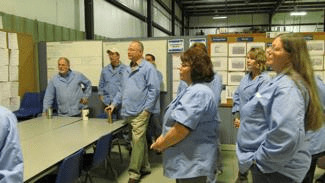 If the equipment manufacturer is extremely customer service-driven, those same folks might get some follow-up training a few weeks later, which may include some tips on fine-tuning the equipment to achieve optimal results. Everyone is happy and confident, and quality is high. Then what happens? Well, years pass and life goes on. Key equipment operators may retire, good employees get promoted to other positions, not-so-good ones find their way to other opportunities. As these transitions occur, the original operators pass down training on that piece of equipment to new operators. Then those folks pass it on to new techs that come to run the equipment, and so on. Or worse yet, a new operator is thrust into the role in a pinch, and expected to figure things out on the fly. Ten years after the original equipment purchase, you walk by as the newest operator is being trained. “Load the material here, press these 2 buttons, and then turn this dial 4 clicks to the right.” Curious, you ask what the 4 clicks to the right do. “I have no idea – that’s just what Fred showed me to do!” You then get peppered with questions as to why maintenance can’t get the machine running right. Telephone training strikes again. Let’s face it, not everyone can be a successful trainer, teacher, or instructor. It takes a mix of capability, proficiency, patience, flexibility, and desire to successfully transfer true understanding from one person to another. Great trainers give you not only the ‘what’ and the ‘how’, but more importantly the ‘why’, which is the critical element in learning any new skill or concept. The ‘why’ element empowers the learner, and really helps all the pieces fit together. Ron Phillips from ACE Production Technologies is one of our best training partners. Ron has visited RBB twice in the last few years to provide excellent training to our selective solder equipment operators and create depth in our abilities. He not only instructs patiently and answers all questions with skill and experience, but he also recommends slight adjustments and meticulously reviews our equipment while he’s here. That gives him the opportunity to instruct our operators in performing preventative maintenance, giving them experience with subtle nuances he’s picked up over the years. They learn from him what to look for if the equipment does have an issue, and what to anticipate from it over time, which greatly increases our up-time. Ron gives our folks the ‘why’. All are key elements to keeping our customers happy in this fast-paced custom electronic assembly shop. At RBB, we cross-train on specific equipment as much as possible. This provides flexibility and exciting challenges to our workforce and increases our swarming capability. (Read more about that here) We prefer to use proven trainers from equipment manufacturers to maximize our training efforts, and provide the best possible return on our customers’ investment. The decision is yours, but we’re choosing NOT to play the telephone game. Pass it on!